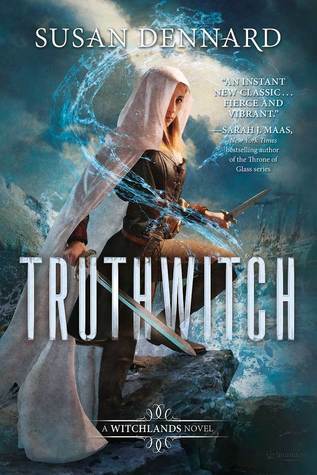 Truthwitch by Susan Dennard is a high fantasy novel that features a strong female friendship and an original magic system. It is the first novel in the Witchlands series. As a Truthwitch, Safi always knew that people would kill to have her power, yet this is the first time that she’s actually experienced it. She and her best friend Iseult are always getting into trouble, but usually there’s someone there to fix things up when they go wrong. Unfortunately, this time that’s not the case. With a peace treaty coming to an end, all the countries are preparing for war and looking for ways to one up their neighbors. The ability to tell the truth from a lie could sure come in handy. I really enjoyed this book. At the beginning I felt like I wasn’t connecting with the characters much but the pacing was really good and I quickly got into it. I also liked how the main characters were such close friends because that’s something which is not really common in YA books. The focus is usually on the romance with any friends being almost like second thoughts, or possible love interests. It was good how the book gave a good insight into multiple cultures in the world without it feeling forced. They were all really different in ways that didn’t seem too overly dramatic and I liked how they weren’t all completely separate. There were a realistic mixing between the cultures and countries. Compared to most other fantasy novels this one felt controlled, the author wasn’t throwing all possible elements on the page which allows many directions for the series to grow. The plot and characters were well thought out and everything served a purpose. I really liked the plot arch in this book, it was just so perfect and everything came together well. The characters were easy to understand, yet still very unique. The female characters were strong but had flaws which was great to see and proved that nobody is perfect. The flaws that are typically presented for female characters are that they are too emotional or sensitive, too shy or unassertive or that they aren’t grounded enough. The main character Safiya was none of these, she was a woman of action yet she had parts of her personality that needed work. As someone who is loud and reasonable confident that was something that I could relate to. That’s a good point about Safiya’s selfishness, and I think towards the end of the book she was starting to think about others a bit more but there’s still a lot of character development that can be done over the series there. I also really enjoyed the relationship between Safiya and the Prince. It didn’t feel forced and instead developed naturally over time. The thing I liked best about this book was the world building. The magic system seemed so well thought out and was in my mind pretty original. It will be interesting to see what other types of magic are introduced as we meet more characters, and I am not quite sure what the percentage of the population in possession of powers is exactly but I’d presume it’s slightly over half. I’m not quite sure (let me know what you think if you’ve read the series). I’m giving this book four our of five stars, I was slightly pulled towards giving it five stars however I am waiting to be completely engrossed into this series, which will hopefully happen with the second book that is coming out next year. I have high hopes for this series. What did you think of Truthwitch? Great review. This one is on my TBR but I’m yet to get to it! I’m glad to hear it’s well structured and that the friendships are coming first.